We are excited to announce the First Soo Theatre Membership Drive. 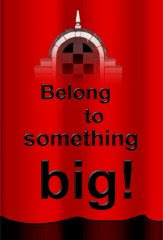 Belong to Something Big! By becoming a member, you are sharing in a community effort and supporting programs that are impacting thousands of people in the Eastern Upper Peninsula. We want to continue to share with even more people. Volunteers at the Soo Theatre Project have made great strides since March of 2003 when we purchased our huge building complex in the heart of downtown Sault Ste. Marie. We have repaired the building and opened the theatre to dozens of shows, have put hundreds of local performers (including lots of kids) on stage, and have welcomed amazing entertainers from all over the US and Canada to our area. For a sample of what's been happening at the Soo Theatre, check out our Photo Galleries. STARS*, the Soo Theatre Arts Resource Studios, has grown to more than 400 students, and our many performing groups have performed on our own stage and at many events throughout the area. For a brochure listing our current class offerings, see the STARS home page . We encourage you to help us pay our heat, light, insurance, and other bills by making a commitment to whatever amount you can give us on an annual or perhaps a monthly basis. Every donation is important to us! Belong to Something Big! Become a member today! *STARS is a program of the Soo Theatre Project, housed in the historic Soo Theatre complex.